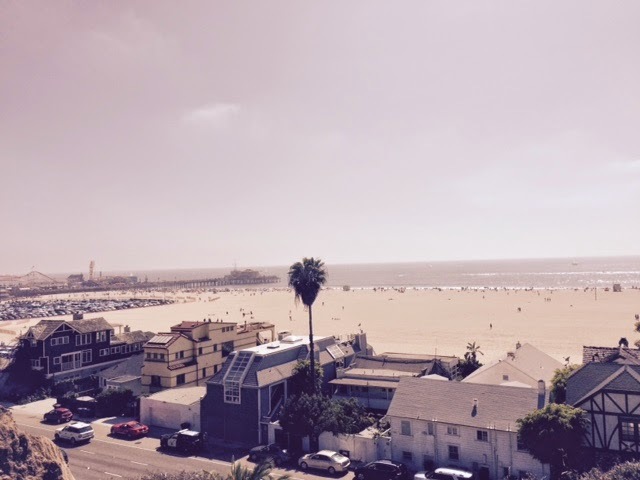 Texan Girl Talks: A Santa Monica Weekend! So I've really been sucking at these Short Post Sundays... I've missed two weeks in a row.. I will get better. Maybe. BUT my life is pretty much just consumed of resumes, cover letters and endless job applications. The unemployed life is hard for a type A person like myself. The struggle!!! On Saturday, we needed to do a little exploring. So we braved the dreaded Los Angeles traffic, the weird thing is, I think we're both getting used to it = we stopped b*tching about it as much. 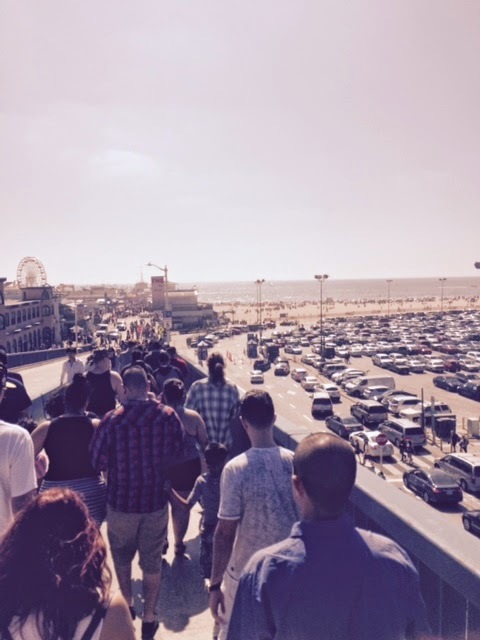 We initially wanted to scope out the Santa Monica aquarium, but kind of got side tracked.. by the The Pier. I've wanted to go on this pier for as long as I could remember. We ate lunch at a ridiculously, expensive place for lunch time, but hey I guess it's all about the experience. One day, we'll have kids and won't be able to do this as much. 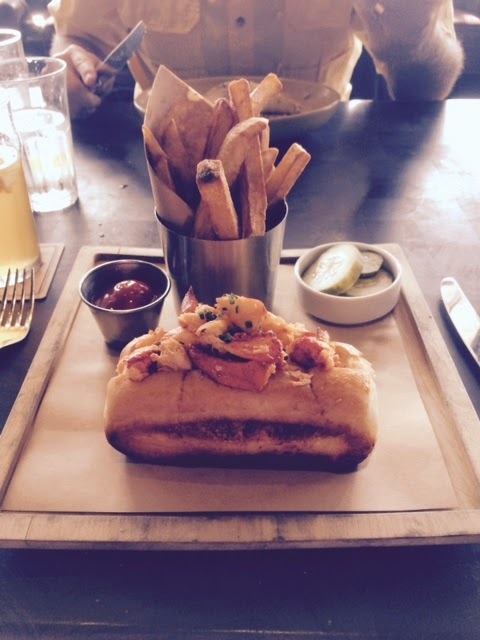 Yes, that's a lobster roll, it was like eating a buttery, carb-y roll of cholesterol. I enjoyed every bit. I got to sit, eat this and people watch on Ocean Ave. It was pretty spectacular. I know my people watching friends are peanut butter and JEALOUS! 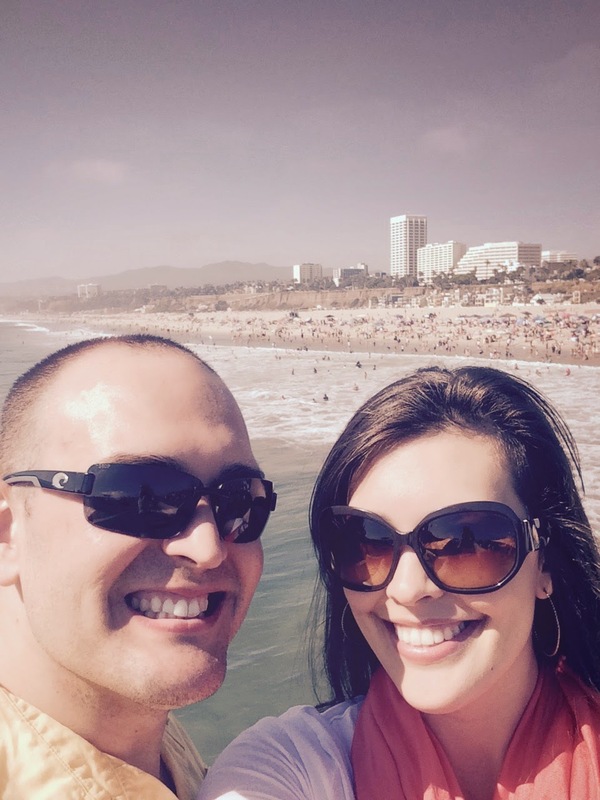 I've pretty much made up my mind that the Santa Monica Pier is a multitude of things that are fabulous. 1. The views. You cannot beat these views. The weather was amazing. Not only was it sunny, it was 70 degrees, but actually felt like 60 degree weather. Note: I had a scarf on that I didn't have to take off. Amazing. 2. To the average joe, you might see a crowd of people and say to yourself, "Hell, no. Way too many people for me!". For me this is a treasure trove of people watching. I saw people wearing ridiculous things, shameful things, elderly people wearing next to nothing (my goodness, I should have put that under shameful things), tons of kiddos so happy to be in the hustle and bustle and some amazing musicians trying to make their mark on the world with their wonderful talents. There was a girl singing Disney songs that made me want to sing-a-long. I didn't, but had I had another beer at lunch, I might have. Matt is a lucky man. 3. In all the chaos, I found a peaceful place. There will always be something peaceful about watching waves crash upon the shore. Always. 4. SEALS. 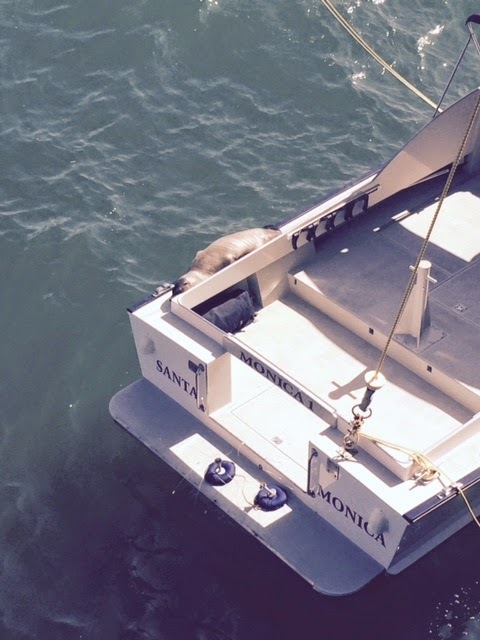 When I saw this seal sunbathing on a random boat, I NEARLY DIED, PEOPLE. How freaking amazing. You know you're from Texas when we get super excited about this. You don't see wild life like this in the gulf, at least from Galveston you don't. and then another seal tried to hang out too! I was in awe. Matt, didn't even tell me to calm down. He was amazed too. 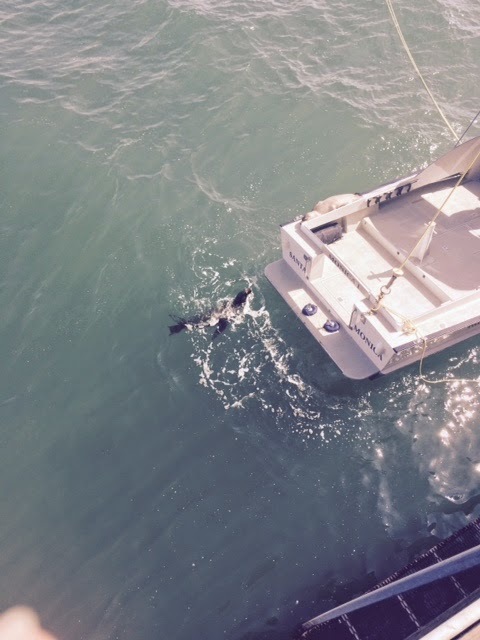 I did manage to see how vicious seals can be, Seal #1 was NOT amused by seal #2 barging in to his sunbathing time. 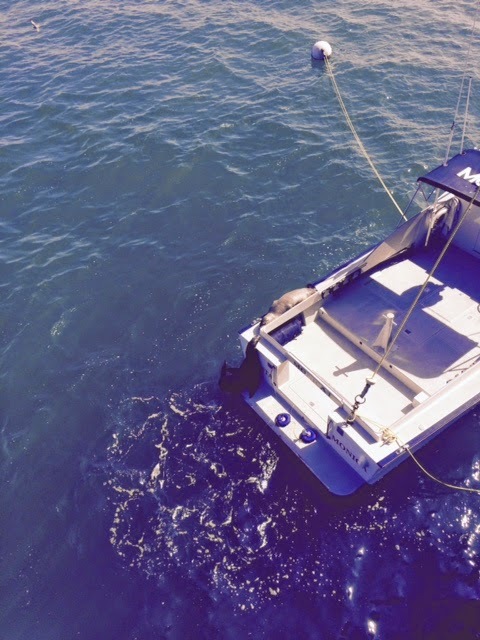 I don't blame him, Seal #2 find your own boat! Geez. 5. Ice cream cones with one the best people in the entire world. 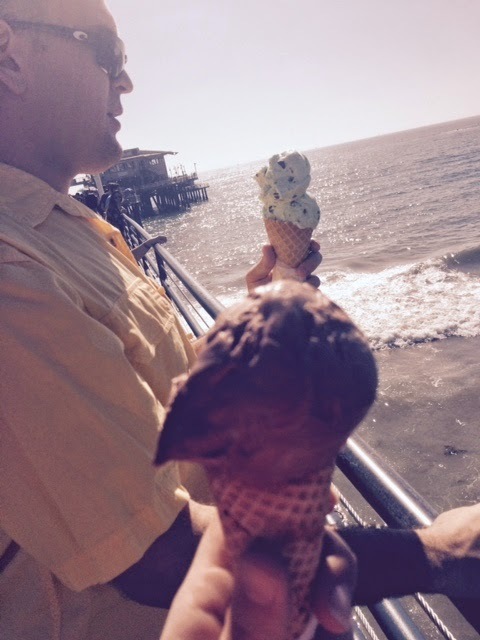 I think he found his happy place too, in a cone of Mint Chocolate Chip ice cream. Be still my heart. I had an absolute amazing day. 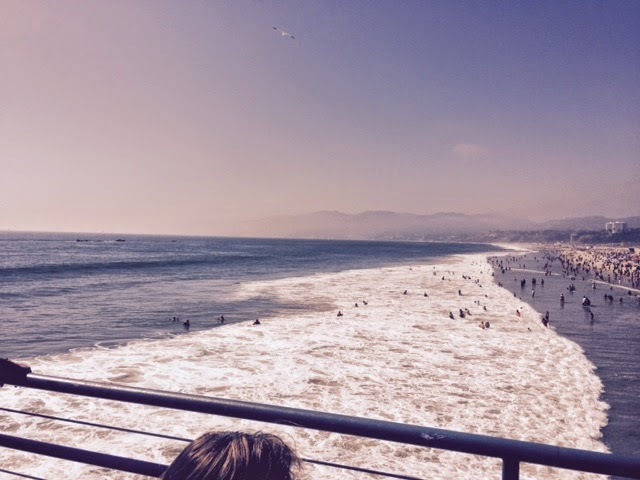 Santa Monica Pier was great and I can't wait to take all my friends that I KNOW WILL COME VISIT ME there. You know who you are. Our Sunday was somewhat productive, while Matt stressed out about the woahs of the upcoming week, I decided to put some stuff on the walls. It was getting to me that we've been here nearly a month and still had barely anything up on the walls. 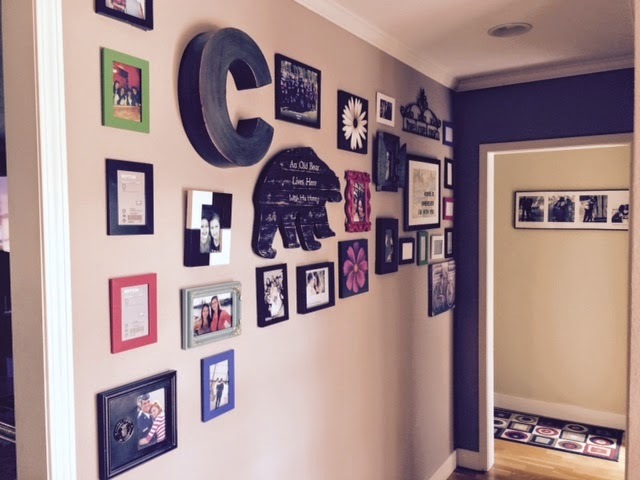 Now this wall is still in progress, but every time I walk by it, I love it a little more. It really kind of symbolizes who we are, a big, crazy, organized mess. I hope your week is amazing.